This is about something lost and found on more than one level. First off, this story is an old one, lost in a folder on my hard drive. I happened to find it this morning and thought I would add it to the stories here. Once upon a time in a land far, far away… oh, wait! This isn’t a fairy tale, it’s a farm tale! And it happened in recent times, when a friend of mine came to visit. (Hi RR!) As usual, though she purports to be coming to see me, we made the tour outside so she could see how much the animals had grown from her last visit, like the lambs and goat kids, and check out all the recent arrivals, like the different types of new chicks: Buff Orpington Chickens, guinea keets, and peachicks. 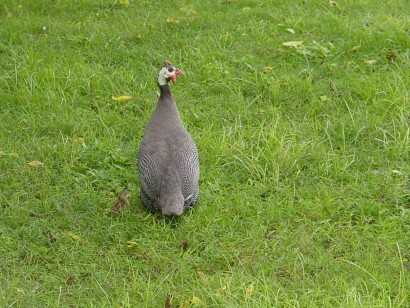 I especially wanted to show her the guinea hen with her lone chick and adoptee keets. Of course, I had to brag on what a good mother the hen was, and how amazed I was she adopted these babies when she didn’t hatch them out. 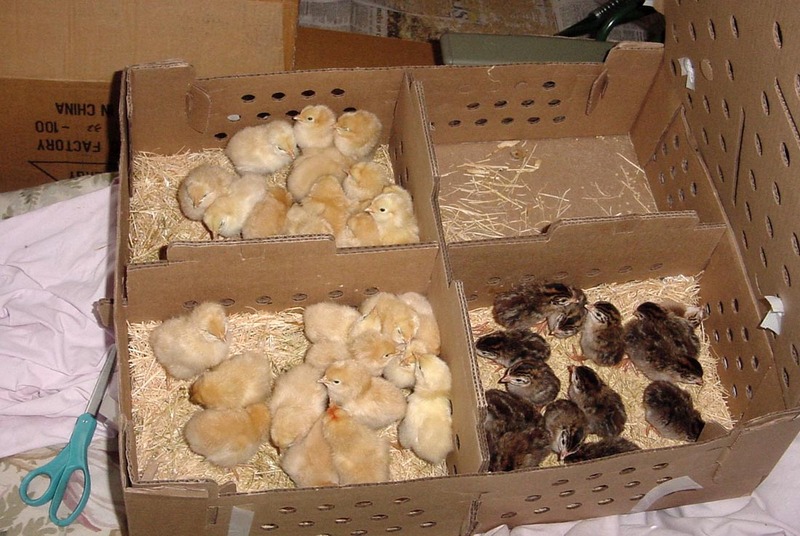 I knew you could put another hen’s eggs under a broody hen, and if she hatched out the eggs she’d treat them like her own, even if a different variety of poultry, but I’d never heard of a hen adopting stray chicks. Guinea hen with her original lone keet. 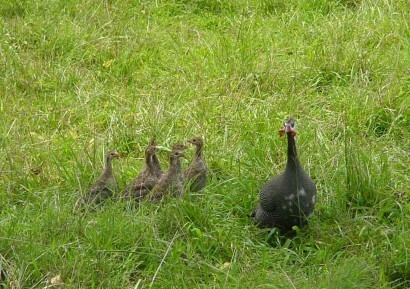 Mama guinea hen had the keets out in the main pasture foraging when we found them. After checking them out, we wandered over to the garden, commiserating over how the uncooperative weather had decimated our gardens. As we were chatting, suddenly there was a big ruckus in the upper pasture and birds took off in all directions! Two of the guineas were running pell-mell towards their pen, while another was flying in that direction, and a big hawk flew off in yet another direction. Neither of us saw anything in the hawk’s beak or talons, but we wondered where the keets were since obviously that was what the hawk was after. The adult guineas had bailed out – there were no chicks with them, much to my chagrin. Here I’d just been bragging about how well this hen was taking care of all those babies and she left them behind for a hawk snack! We began a search for the keets, figuring there was no way the hawk could have got all of them in the short space of time between when we’d seen them and the hawk tried to make a meal of them. We hiked all over that pasture once, twice, and then again. We didn’t see or hear any babies anywhere. We headed up into the orchard just in case the keets ran in that direction, but once again, no babies. My friend walked down through the strip with our new trees between the road and pasture, and no babies there either. No babies in the garden. Check out the pen again, but no, the babies definitely weren’t with the adults. We walked around the pasture some more, wondering how on earth that hawk could possibly have got all six of those keets. About the time we were ready to give it up as a lost cause, Mama Hen came strutting out into the pasture and started clucking. There were little peeps replying to the hen. I homed in on the sound with RR right behind me. 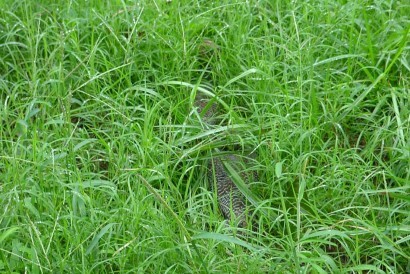 Finally we discovered a couple of little keets nestled deep in the grass. The hawk didn’t get them all! 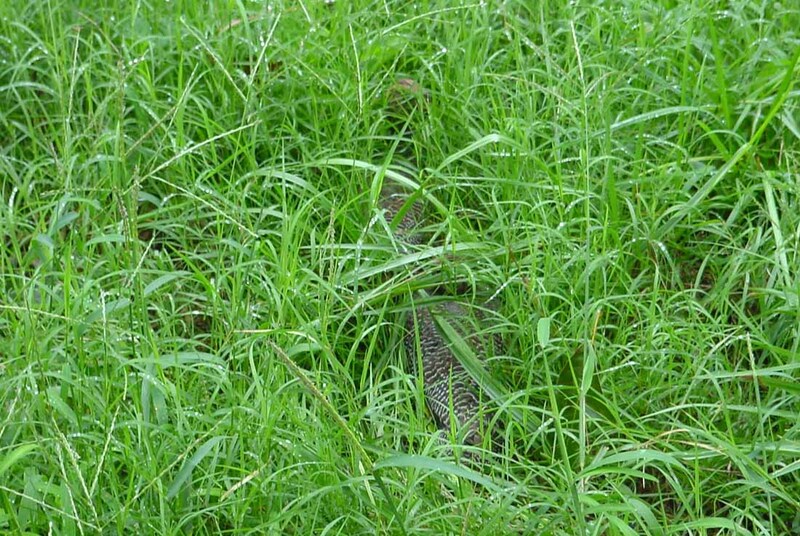 What great camouflage! We’d passed them several times and never saw them. In fact, they blended so well that upon closer inspection we discovered all six chicks within an area of three feet or so. The hawk hadn’t got a single one! It pains me to admit that a dumber-than-a-rock guinea was smarter than I was. She knew to run away to try and fool the hawk into following her instead of looking for the keets, who instinctively held very still and quiet until mama came back to collect them. So the keets were never really lost after all! Mama hen knew just where to find them. Mama Guinea Hen with Her Keet Babies a few weeks later.